The oldest-known car manufactured under the auspices of the Ford Motor Company is set to cross the block at the annual RM Auction in Hershey, Pennsylvania, which takes place October 11th and 12th. 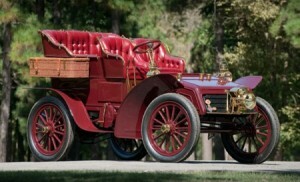 According to Hemmings.com, the 1903 Model A Rear Entry Tonneau was one of a batch of the first three cars manufactured by the automaker, and was purchased by Herbert L. McNary, a butter maker from Britt, Iowa. The red four-seat vehicle is powered by 8hp 100-cu.in. flat two-cylinder engine and sold for $850 at the time. The car first changed hands fifty years later when it was sold for $400, then went through a number of subsequent owners, the most recent one purchasing it for in 2007 for $693,000 at an RM Auction in Arizona, its rarity driving up the price significantly during the intervening years. The Model A was last offered for auction in 2010, but bidding failed to meet an undisclosed reserve. This time around, the car has a pre-sale estimate of $300,000 to $500,000, according to RM Auctions.